Habe gefischt bis ich 5 Frosttiefenelritze hatte. Habe alle 5 hintereinander besiegt - der Letzte von denen war der einzigste der 2 Nats Glücksmünze sowie 1 Reitschildkröte gedropt hat. This mount drops off the Höhlenbewohner der Frosttiefen which you can fish up from a Tier 3 Fishing Shack in your Garrison. I just got one from my first time killing one. He spawns off of Frosttiefenelritze which you throw in the water and he'll just come running at you. If you have a level 3 fishing shack and Nat Pagle assigned to it. You can catch a H: Frosttiefenelritze | A: Mondsturzkarpfen, which will then summon a H: Höhlenbewohner der Frosttiefen | A: Höhlenbewohner von Mondsturz. Once you have killed it but make sure you equip your weapons if you equipped your own fishing pole. You can loot some fishing items(including a Nats Glücksmünze) and will have a chance to drop this mount. Now that this drops from Frosttiefenelritze and Mondsturzkarpfen is this the only TCG mount that can be aquired in-game without gold? the below statement is wrong. he confused with Meeresschildkröte. 4/6/15 Got my Meeresschildkröte just now! Took about 30 kills from Frostdeeps's and at most 1k casts. Got 12 Nat coins and basically every drop available from the book to the monocle in the process. Was at 1100 fishing w/ the hat and the fishing pole the frostdeep's dropped + the Worm supreme which I ended up with 3 stacks of. Took all night with not really paying attention fishing while watching netflix with the wifey. I would recommend not spawning them until you get the max stack of 5 because it seemed like every time I got one, the next one I got came a lot quicker and they always dropped in quick succession, when I used one then fished it always seemed like an eternity passed before the next one dropped. Also, when using a lot of different bait, a higher fishing skill most certainly made it drop quicker, every worm supreme used I always got at least one to drop while as with the 100+ and the 75+ only got me one every other or more. I did not have Nat as a follower while doing this. Good luck everyone! I'll be trying for the Reitschildkröte next. Edit: 4/7/15 Just got my Reitschildkröte ! took 12 kills with the same exact setup. Make sure to have your fishing as high as you can, collect 5 frostdeep's and then kill all 5 before looting. 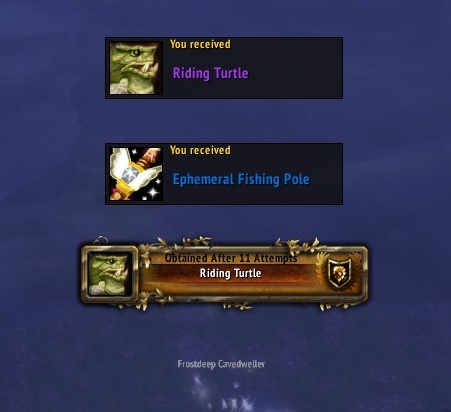 It's all I did, with 1100 fishing skill and it worked with both turtles. (: I hope you guy's get one too. I killed 411 Höhlenbewohner der Frosttiefen catching 411 Frosttiefenelritze and Reitschildkröte FINALLY DROPPED. Of those 411, I've also gotten 6 Ungewöhnlicher Kompass and 134 Nats Glücksmünze. Got the Meeresschildkröte after 260th Höhlenbewohner der Frosttiefen kill and at long last had the Reitschildkröte drop on my 435th kill. This was by far the most tedious of all grinds I've ever done but in the end it was worth it. 700 base + Extraordinärer Wurm + Kurzlebige Angelrute + Kappe des obersten Anglers (orTentakelhut) there is ~8% chance to catch your Mondsturzkarpfen if you attach a special fishing lure like Köder für dicke Schläfer. If you don't attach a special fishing lure - only the Extraordinärer Wurm - there is a significant higher chance (~12%) to catch your Mondsturzkarpfen! As of 07/22/2016 the new personal loot changes allow a 40-Man group to share all loot from each Höhlenbewohner der Frosttiefen. This effectively increases the drop rate by 40 times. I personally got both Reitschildkröte and Meeresschildkröte within one hour of fishing in garrison, while in a 40 man group. While you do NOT need the achievement Draenorangler to loot these mounts, you do need it to fish up Frosttiefenelritze, which is what summons Höhlenbewohner der Frosttiefen, or Höhlenbewohner von Mondsturz which in turn is what drops the mounts. It is also worth mentioning that these mounts can be traded to other raid members for two hours. Got my Reitschildkröte today after 2 hours fishing in a 40m raid in Garrison. Piece of advice, leave some trash loot on some of the murlocs that day near you so you don't have to move around because of DK's using death grip all over the place. The new personal loot changes allow a 40-Man group to share all loot from each Frostdeep Cavedweller. If like me you hate looting them one by one then use a Plünderang It makes it easier to AFK as it automatically targets the mob. TIP: Not a lot of people think about it, but if you have a Plünderang then you can use that toy to loot all of the bodies fast and easy! And as of 5.2 this item no longer requires a target, so you can just literally abuse that toy! (only 3 seconds cd). This mount did drop from fishing in my garrison yesterday. 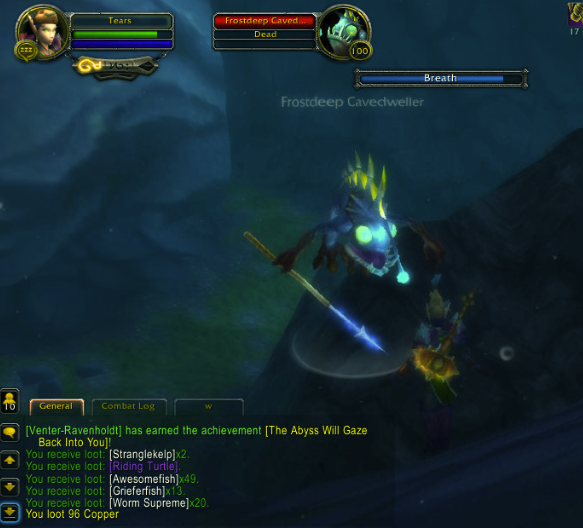 I fished Frosttiefenelritze, and then killed the NPC and got the mount. I didn't know this was a rare mount, now I'm happy. Obtained this cutie June 7th, after 594 Frosttiefenelritze. Happy Fishing! "Mit Ruhe und Gelassenheit kommt man vielleicht nicht als Erster durchs Ziel, doch kommt man wenigstens an... irgendwann."